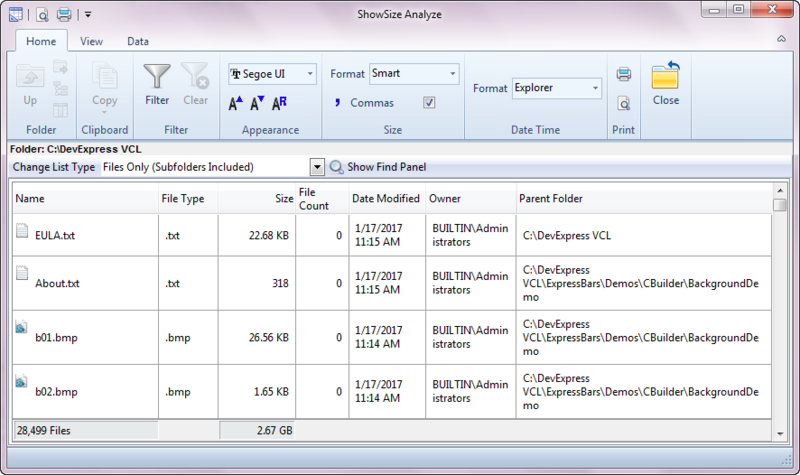 ShowSize Analyze comes with Paid Version of ShowSize. Use it for advanced filtering, printing and export of disk space data. It automatically starts on the current data from the Filter--Advanced Filter Tool menu. 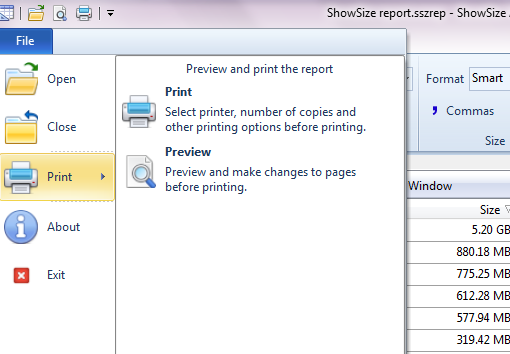 If you save a report file with ShowSize by using its File menu, you can then open the report in ShowSize Analyze. Best thing is that you can view this report on any other system too with either ShowSize or ShowSize Analyze. 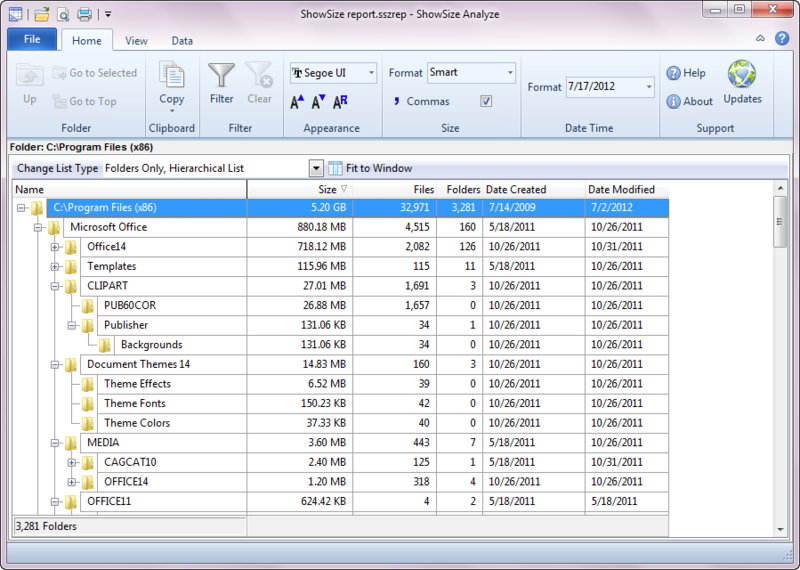 ShowSize Analyze offers advanced filtering, printing and export features. If you couldn't do certain advanced filtering operations in ShowSize, now you can do that with ShowSize Analyze. The Change List Type drop down menu lets you switch between various lists available for viewing. There are only flat lists in ShowSize Analyze. This is because it supports advanced database like filtering that is not possible in a tree list. The filtering features in ShowSize Analyze are very powerful. Click on the Filter button and a screen appears that lets you specify various conditions of different columns to see a filtered report. The entry for filters is made easier by providing a drop down listing many values from the report. See how this drop down appears for Created Date in the picture above. 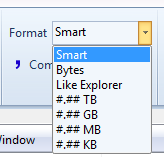 Similarly, when you go to enter the size value, you can use a Calc button that lets you easily enter byte values for bigger values like those in MB. Here is a picture of the Size entry helper. The summary totals at the bottom take filters into account. This is very convenient. You can even save and restore the filter settings by different names. But note that a saved filter setting can only be applied later to the same kind of report. It won’t work on a different report. You can do many selections with filters that you can't do in ShowSize. 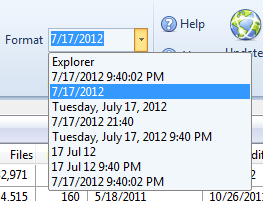 For example, when I want to see all the modified between certain dates. As you have seen above, filtering features are powerful. But filtering can be slow for a very large report. So please use it accordingly either on the top folder or subfolders depending on how fast it works. 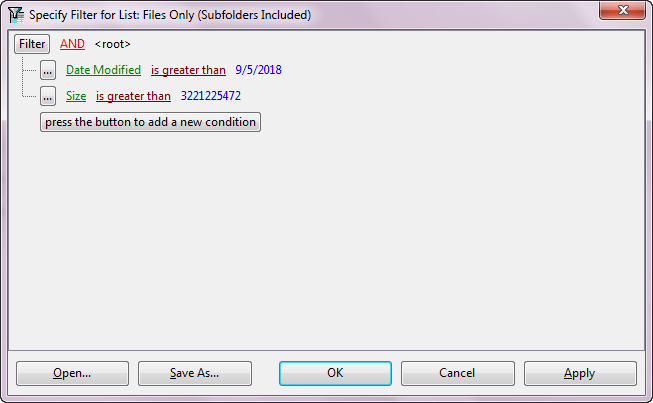 Folder group: You can select a folder within a list and can drill down (go to that folder) so that the list is reduced to show the items within that folder only. 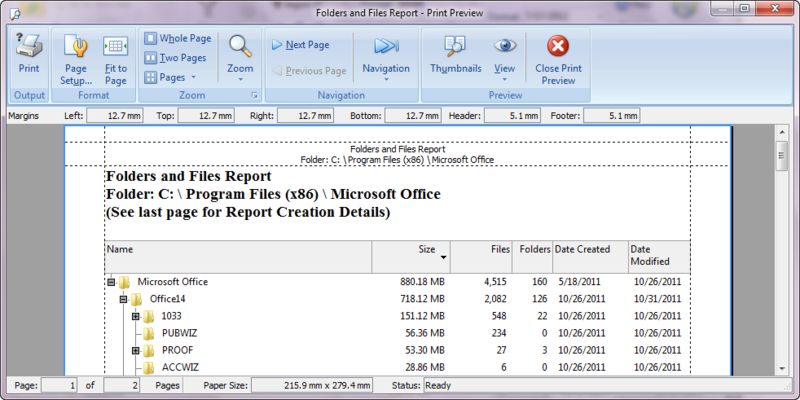 Then you can go to the parent folder or directly go to the topmost folder in the report. Clipboard group: The Copy drop down menu allows you to copy full selected rows, only file names or full file names to the clipboard. This helps you make batch operations on those files in other utilities. Filter group: I have described Filters in detail, later on this page. Appearance group: You can select a suitable font for the list and can enlarge, reduce or reset the font with simple buttons. This would be specially useful when you go to print the report and need more choices to fit the report in the paper width. Size group: This program introduces more display options for the Size column than those available in ShowSize. They would be specially useful when you go to export the list in Excel format. Date/time group: Similarly, there are nice options to display the Created and Modified columns in various date/time formats. Support group: You get easy options to get help and support and to verify if any updates are available. Export operations are available on the Data ribbon menu. 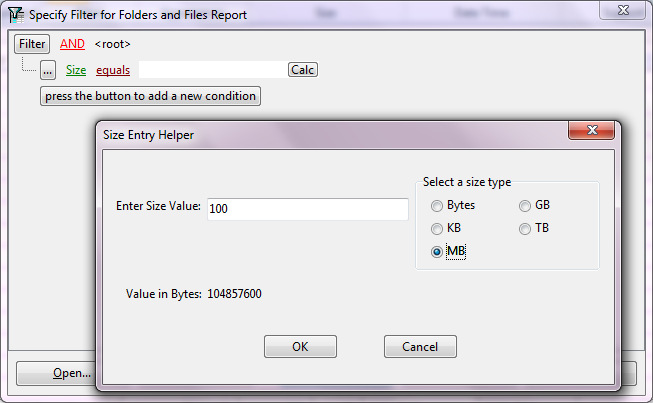 It can export the report to the latest Excel file format (.XLSX), CSV and XML. This allows you to do your own analysis in Excel and other programs. ShowSize Analyze has nice printing features and can print unicode items correctly. It also has an impressive Print Preview window as shown below. However, we are dependent on third party libraries to provide this feature. So there are some limitations and some plus points of using such libraries. For example, even if you decide to print a small, selected page range, it makes a full preview first. So if you have a large report, you may still need to wait a long time to print only a few pages. The plus point is that in future, we can easily provide a PDF printing feature from the same Preview window.